The Dutch Safety Board’s (DSB’s) preliminary report into the crash of Malaysia Airlines Flight 17 (MH17) is being portrayed by imperialist governments and their media spokesmen as confirmation that anti-Kiev rebels in eastern Ukraine shot the plane down with a Russian-supplied Buk surface-to-air missile. While claims of indirect Russian responsibility for the destruction of MH17 are at the heart of the US-NATO propaganda over Ukraine, the report says nothing of the sort. In fact, it does not even state that the aircraft was shot down. 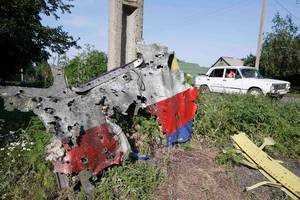 MH17 crashed on July 17, in the war zone of eastern Ukraine. All 298 passengers and crew members lost their lives. The DSB’s report states that, in accordance with the stated “sole objective” of “the prevention of similar accidents and incidents,” it does not “apportion blame or liability in respect of any party”—something that the capitalist media downplays or ignores. The only basis on which the media can again repeat their assertions that pro-Russian separatists were responsible is the report’s statement that “The damage observed in the forward section of the aircraft appears to indicate that the aircraft was penetrated by a large number of high-energy objects from outside the aircraft” (emphasis added). But the report never once identifies what it means by “high-energy objects.” It also claims that, even though enough of the wreckage was recovered to confirm that the aircraft appears to have been particularly badly hit above the level of the cockpit floor, DSB investigators supposedly failed to recover or study any of the objects that penetrated the plane. The report as issued is equally compatible with radar and satellite data presented July 21 by the Russian military, indicating that a Ukrainian SU-25 fighter jet was in the immediate vicinity and ascending towards MH17 as it was shot down. Missiles and machinegun rounds fired by an SU-25 are also “high-energy objects.” This possibility has not been addressed, let alone refuted by Kiev, Washington or anyone else involved in the investigation. On August 9, the Malaysian New Straits Times published an article effectively charging the Kiev regime with shooting down MH17. It stated that evidence from the crash site indicated that the plane was shot down by a Ukrainian fighter with a missile followed by heavy machine gun fire. The report was subsequently ignored by the world’s media. In the days immediately following the tragic incident, the accusations now repeated ad nauseam were used to ramp up a confrontation with Russia, including punitive sanctions and NATO military manoeuvres. Since then, at least up until yesterday, an extraordinary silence descended over the affair. Now, once again, without any evidence, the world’s population faces a new barrage of propaganda from Washington and Kiev and their accomplices. In fact, not one word of anything reported regarding the fate of flight MH17 can be taken at face value. All of those involved in the investigation and its coverage have a vested interest in asserting Russia’s responsibility, at least indirectly, for the plane being shot down. The 34-page DSB report is based upon an investigation in accordance with the statutes of the International Civil Aviation Organisation (ICAO), an agency of the United Nations. Ukraine requested the Netherlands undertake the investigation on July 23, 2014, a week after the crash. A full report will not be made until sometime within a year of the investigation being launched. The preliminary findings were based on an analysis of photographs collected by various sources, radar footage obtained from Ukraine and Russia and initial reports from Ukrainian and Malaysian crash investigators. Due to the area of the site remaining a war zone, the DSB said access to the site of the wreckage by international air safety experts had not yet been possible and it was their intention to visit the site when it was safe to do so. The DSB does not address the absence of any satellite imagery or radar data, or any other evidence supplied by US intelligence agencies, which operate the most powerful global surveillance network. It is implausible, to say the least, to imagine that Washington’s vast apparatus was paying no attention to the war zone of eastern Ukraine, which is also a regular flight path for many commercial airline flights. In sharp contrast, following the bombing of Pan Am Flight 103 over Lockerbie, Scotland, in 1988, photographs of the area taken by a French satellite were delivered to the investigators within hours. The US Department of Defence and NASA also provided the investigation with high-resolution photographs from spy satellites. Despite Russia continually requesting that the US administration supply the investigation with the images and data it obviously possesses relating to the MH17 crash, it has refused to do so. A separate criminal investigation into the crash is being carried out by the Dutch prosecution service at The Hague, involving 10 Dutch prosecutors and 200 police officers. In this case, the criminal investigators have given no time scale as to when their investigation will be completed. Critical information regarding the fate of MH17 is likely being withheld. A leaked document dated August 8 and obtained by the Russian website Live Journal and translated into English by the Global Research web site is reportedly a non-disclosure agreement signed by the four nations involved in the MH17 investigation—Ukraine, the Netherlands, Australia and Belgium. Under its terms, all intermediate results of the ongoing investigation will be classified. The document includes a stipulation that publication of the investigation’s final results would only take place if Ukraine, the Netherlands, Australia and Belgium arrived at a consensus.